The Arab League's monitoring chief has warned of an escalation of violence in Syria in recent days, as the government intensifies its crackdown on protests. Gen Mustafa al-Dabi said the violence would make it more difficult for the two sides to engage in talks. Activists say 135 people have died in two days. A BBC reporter in Damascus says the regime appears to be losing control of rebellious areas of the capital. The UN Security Council is due to discuss a draft resolution on Syria. The BBC's Jeremy Bowen in Damascus says opposition fighters have set up checkpoints and appear to move around freely in the suburbs of Douma and Saqba. President Bashar al-Assad's forces still operate in these areas, but they do not appear to be able to maintain control, our correspondent says. A convoy of journalists, without regime minders, went alone to Saqba, a poor district about 20 minutes from central Damascus, where a funeral was due to happen of a man killed by the Assad regime's forces. Once we left the centre we saw no regime security men. Then on the edge of Saqba we came upon several dozen armed and masked fighters from the Free Syria Army. It's clear that the regime forces, when they deploy enough men, can enter the rebellious suburbs of Damascus. But they do not appear to have the force to hold them. Mourners chanted: "Better to die than be humiliated." Much of the violence in the past two days has focused on the central city of Homs. Activists say Homs was bombarded on Thursday and more than 30 people were killed. Rami Abdul-Rahman of the the UK-based Syrian Observatory for Human Rights described the attack as "a terrifying massacre". More deaths were reported in Homs on Friday, and the nearby city of Hama also came under assault with heavy gunfire and loud explosions. Earlier it was reported that 30 people had been killed in Hama, but rights groups now give a much lower figure. The Local Coordination Committees, a Syria-based network of activists, reported deaths in cities across the country. On Friday evening, the group said 135 people had been killed in the past two days. Gen Dabi, whose monitoring mission has been extended until late February, said violence had soared "in a significant way" in recent days. Earlier in the week the general had claimed that the Arab League mission had helped bring down violence in Syria. 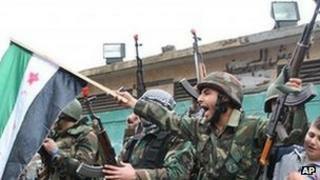 The mission was set up in late December to monitor Damascus' compliance with a league plan to end the fighting. But six league members, including Saudi Arabia, have decided to withdraw their observers in protest at the continuing crackdown. It is thought that Friday's Security Council meeting, announced by France's UN mission on its Twitter page, will discuss an Arab League plan to end the violence. The plan calls for Syria to form a national unity government with the opposition within two months. The Damascus government has already rejected the initiative, calling it "flagrant interference" in Syria's internal affairs. The UN has conceded it cannot keep track of the death toll, which it estimated earlier as more than 5,400 people. The government says it is fighting "terrorists and armed gangs" and claims that some 2,000 members of the security forces have been killed since the unrest began last March.